In 2013, I resolved to lose the weight I'd gained from a sedentary lifestyle mixed with immune system issues including hypothyroidism. 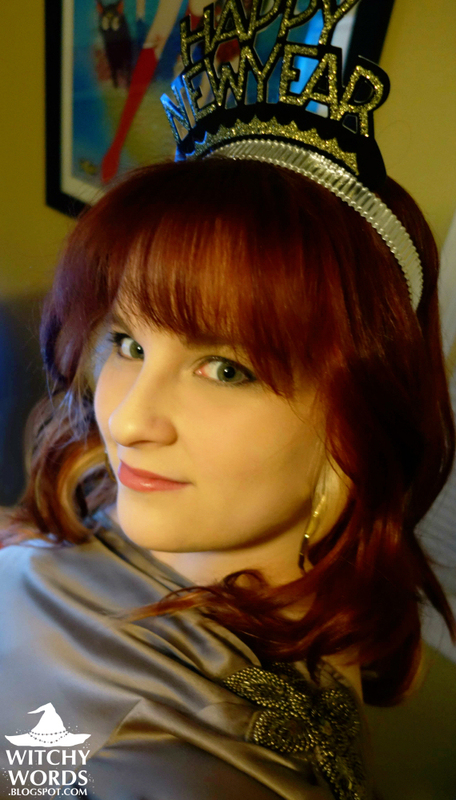 By August 2013, when we moved into our 2 bedroom apartment, I was just a mere five pounds from goal weight. But then something happened: I got a piece of dust in my eye that scratched my cornea. The cornea ulcer healed with antibiotic drops, but my immune system began attacking my eyes. It took several doctors and hospital visits to diagnose the autoimmune scleritis I ended up with. By that point, my vision had changed drastically as the inflammation was warping my lens and my brain couldn't keep up. I already couldn't see well, but as the pain increased, my actual vision decreased. I typically say that I spent about four months nearly blind, and it's true. And when you're not used to being blind, working out is incredibly difficult. So I stopped. Then, immediately after my scleritis issues resolved, I ended up with GI issues. That sent me through six months of biopsies and surgeries with diagnoses that ranged from IBD to potential stomach cancer! Ew. During this time, I was given a series of diet regimens that required me to eat a lot of certain likely-bad-for-you foods to look for allergies. It was awful! And I gained a lot of weight. Eventually, I was diagnosed with a gluten allergy that caused the villi in my stomach to become blunted and bleeding. Ouch! But that wasn't the end of it! After my GI issues, I was also diagnosed with a severe Vitamin D deficiency. This is apparently because I struggle to get it from my diet and we lack exposure, particularly during the winter here in Missouri. I'm on a hefty prescription supplement now and it helps immensely. So 2014 was the year of health problems. I want 2015 to be the year of health solutions! My health is the area of my life where I am currently the least happy. I need seven goals to fulfill this area. 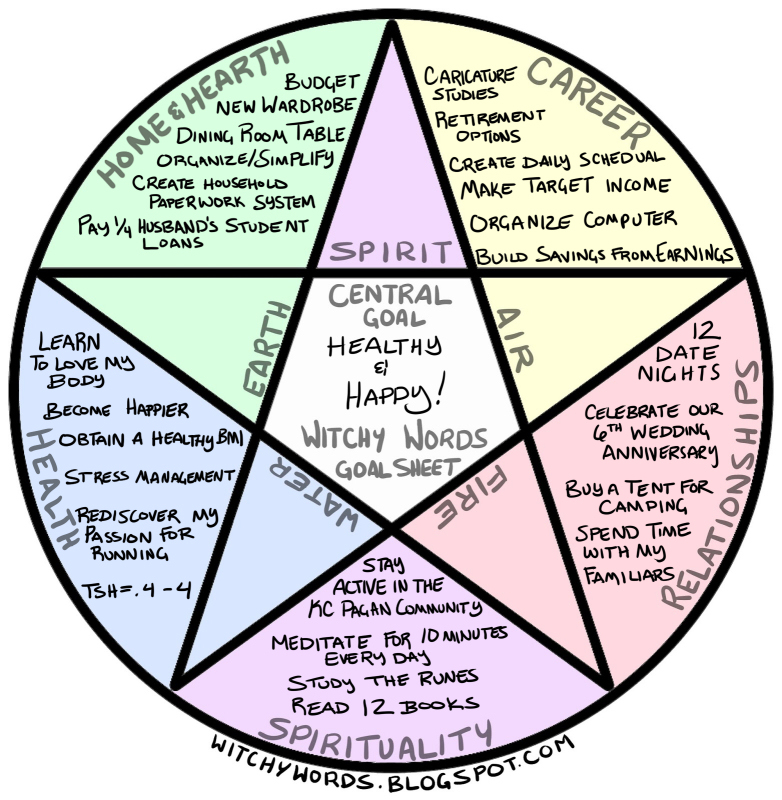 In my Pentacle Chart, I had a lot of goals for Health. Some of them aren't exactly quantifiable, like learning to love my body or becoming happier. Others, I've actually achieved, such as getting my TSH levels between .4 and 4! But that still leaves a bit left! While vanity plays a small role, I primarily need to lose weight for my autoimmune issues. If I can get my weight in check, I can get the inflammation to wane a bit. It's worth it. Plus, the less weight I'm carrying around, the better I'll feel naturally. Admitting my current weight is hard, but here it goes: I'm 204.2 pounds as of this morning. I have never been this big, even prior to all the weight loss I achieved in 2013. The most I've ever weighed is 180-something pounds, and I usually hovered around 165. Some of it was excuses: "I'm blind, so I can't exercise." Surely, I could have found a way to work around it. Some of it was health: I had so many dietary tests that, by the time I officially had a diagnosis from the GI doctor, I was back at my starting weight from 2013. And the rest of it was a total lack of hope. When I stepped on the scale after I was diagnosed and saw that number, I gave up. I absolutely and utterly gave up. It was hard to turn it around. I tried many times and failed. But I need to do the math before I can address those concerns. Remember the SMART goals I discussed earlier? Saying that I want to lose weight isn't enough. How much? By when? Here's how I broke down the math for everything I wanted to do this year. The first step in deciding how much weight to lose is to determine what is a healthy weight for your height. The best way to do that is getting down to a healthy BMI. Online calculators can't give you your exact BMI - that's something you might need to see your doctor for. However, you can get a general range using various online calculators. According to this calculator, which gives you a wide range based on a number of different formulas, the ideal weight for my height is between 107 and 145 lbs. To make it easier on myself for this year, I'm targeting at the high end. My goal weight is 145 lbs, meaning I have 59.2 lbs to lose. If 145 lbs is still too high, I can look at slimming down and toning up next year. To make it easy on myself, I plan on using the full year to reach my goal weight. Rounding up to 60 lbs and dividing it by 12 months, that means I have to lose five pounds a month or 1.15 pounds a week. That sounds a lot more doable than 60, and gets me to my goal easily. 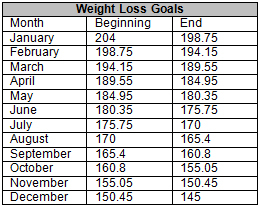 I'll be counting each 15 pound loss as one of the boxes on my goal chart, which gives me four goals right here. Now that I know how much I need to lose and when I need to lose it, I now need to develop a plan. It takes a 3500 calorie deficit to lose one pound, thus I need to have a 4025 calorie deficit weekly, or a 575 calorie daily deficit. Now that I have the math done, I need to figure out just how I'm going to lose this weight and make my deficits. The primary goal for my year is creating a diet that I can maintain throughout my life. This diet should take into account that I have a gluten allergy and am diagnosed with Multiple Autoimmune Disease. There are several fad diets I could look at, including Paleo or Atkins, both of which would help, but I don't want to buy into a fad. I want to make a conscious life decision. So I sat down and talked with my doctor. My doctor suggested maintaining an anti-inflammatory diet. There are specific foods that are scientifically proven to manage inflammation, an autoimmune reaction. I particularly notice inflammation in my knees from psoriatic arthritis, the occasional hives I break out into for no apparent reason (a common element of autoimmune problems) and in my eyes when I'm having a scleritis flare. However, I also have day-to-day mild pain that is likely due to non-specific inflammation. While I'm on medication, diet could also help me. The specific anti-inflammatory diet I'd like to try this year was developed by Dr. Weil. While it appears at first very fad-like, my doctor confirmed that I may find it helpful. 1 serving is 2 cups of salad greens or 1/2 cup of vegetables cooked or cut. Choices: Spinach, collard greens, kale, Swiss chard, carrots, beets, peas, squashes, sea vegetables and washed salad greens. 1.5 - 2 cups chopped per day. Choices: Raspberries, blueberries, strawberries, peaches, nectarines, oranges, red grapes and pomegranates. Choices: Black beans, black-eyed peas, (chickpeas are FODMAP, but I do like them). Choices: Brown rice, wild rice, quinoa, oats. 1 serving is 1 teaspoon of oil, 2 walnuts, 1 tablespoon of flax seeds or 1 ounce of avocado. Choices: Extra virgin olive oil, walnuts, avocados, hemp and flax seeds. 1 serving is four ounces. Choices: Wild Alaskan Salmon, black cod, herring, sardines and tuna. Choices: Shiitake, enokidake, maitake, oyster mushrooms. Choices: Turmeric, curry powder, ginger, basil, cinnamon, rosemary, thyme. Choices: White, green and oolong. A daily vitamin and an Omega-3 as advised by your doctor. I'll also be taking my Vitamin D prescription. Red wine and healthy sweets, such as plain dark chocolate. According to this calculator, I need to consume between 1800 and 2000 calories for maintenance. I'm going to err on the side of caution because my metabolism is incredibly slow and go with 1800 calories as my maintenance line. This is the maximum number of calories I can consume if I don't exercise. It's unhealthy to consume less than 1200 calories a day, so that's my minimum. I've established earlier that I need to have a 4025 calorie deficit every week. If I want to do this through diet alone, which I may want to for the first month or two, I need to have a daily deficit of 575 calories. This means I should consume 1225 calories a day if I'm not exercising. Simple enough! Not sure how to ensure your daily calorie intake goal? Try MyFitnessPal.com! It's a calorie tracker and food diary that will help keep you on top of your goals if you log every day. Want to add me on there? You can find me under the name MariettaDelene. It's no surprise that exercise also helps reduce inflammation. It'll also help burn calories, though I will be likely eating back much of my exercise calories so I don't starve myself. Having lost significant weight once before and also having failed for a year, I know what works for me and what doesn't. What works: Classes. What doesn't: Home exercise programs. So my primary goal this year will be to take advantage of exercise classes. In December, I sought out our local school district's Community Education courses. My usual class from 2013 has not been offered since late 2013, so that's no longer an option. However, I did find that the Zumba class is offered very often. Nearly continuously. I'm not a dancer, but I've heard Zumba is fairly fun and full of cardio. Why not step outside of my comfort zone? 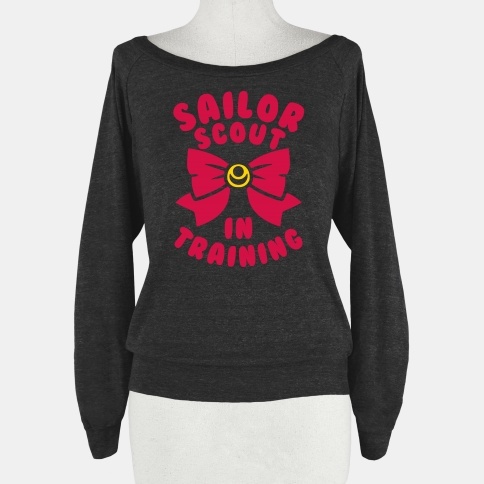 The Winter 2015 catalog listed it from January 20th to May 5th. At that time, they'll release their summer catalog, which often covers early May through August. A friend of mine, Natalie, will be taking the Thursday class with me! Friend and fellow Circle of Fountains member Phaedra also referred me to a studio called Project Shimmy, which is offering a free beginner's belly dancing course on Fridays for six weeks starting January 9th. More dancing! My inner introverted Virgo is dying. 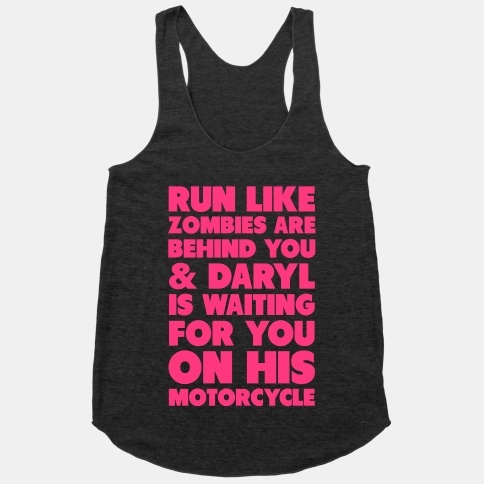 But it'll get me moving, and that's the important part. Plus, I'll be taking it with many of my friends from the KC pagan community, so I won't be alone. I don't know if I'll like belly dancing, or if I'll take another class in it, but I might! If not, our local hospital is offering a Strength and Conditioning class on Mondays and Wednesdays starting February 16th. That starts literally the week after the free belly dancing class ends! Perfect. I know it seems crazy to run around to different organizations looking for classes. "Why not join a gym and take advantage of their free or low-cost classes?" you might ask. After my research, I couldn't find classes that fit my lifestyle or worked with my schedule. Many of the gym's classes are not for beginners. The ones that are charge outrageous fees. All of these classes fall within budget and work with my available times. 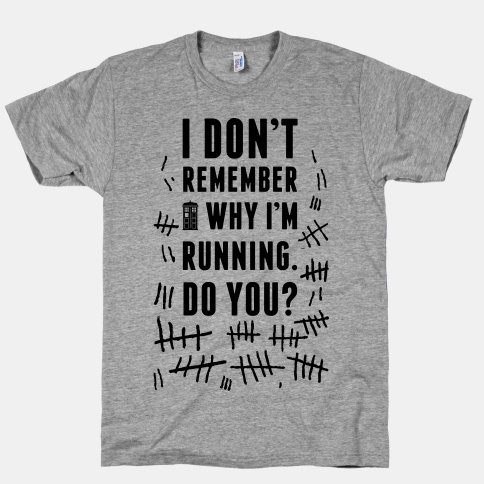 I'll also be wearing my Polar heart rate monitor to get a gauge on how many calories I'm burning so I don't starve myself. At this point, I'll be exercising three times a week during January and, starting in late February, I'll be upping that to four times a week. Five if I enjoyed the belly dancing class and they have a Friday course, or if I find something else come March. I will be reevaluating all of these goals every few months to make sure I'm on track. These will be fairly instant rewards that I receive upon completion of a certain number of pounds lost. Instead of going towards whole numbers, I decided to reward myself when I hit my monthly goal. 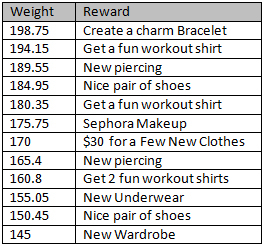 So I sat down and brainstormed some non-food rewards I could give myself. Last year, I created a charm bracelet that would signify my journey. Unfortunately, the bracelet itself was cheap and fell apart within a week. I think a good first month reward would be constructing a well-made charm bracelet. I can't get tattoos because I have autoimmune problems (woe is me!) but I am thinking about a couple new piercings as they're less taxing on my system. I only have one set of piercings in my ears, so I'm thinking of adding an upper lobe along with either an orbital, helix or industrial, or an eyebrow or nose piercing - Just one of those. I'm a little nervous because I'm not a fan of needles, but sometimes you've got to do things that scare you to get what you want! My mom doesn't wear makeup. Not even a little. Never has. I, however, love makeup. I'm just not very good at it! I do a little mascara and eyeliner with the occasional concealer when needed, but that's about it. So I'm thinking about buying a Sephora gift card for makeup and having a representative teach me how to wear it. 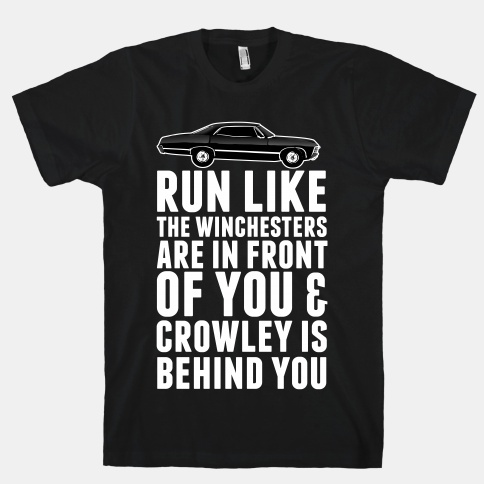 I also have a bunch of things I need, such as shoes, the occasional new clothes and even new underwear. None of the rewards prior to the last reward should go above $60, except perhaps the Sephora makeup tutorial. Notice that I've put this directly in the middle as my halfway goal. The final goal, however, is a brand new wardrobe. I'm going to pay myself per pound for this, starting with $1 for the first fifteen, $2 for the next 15, and then increasing it per every five pounds. 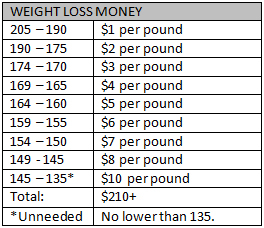 If I reach 145 lbs and lose a bit more, limited to 135 lbs as the smallest I'm willing to go this year, I'll give myself $10 per pound. Woo! The total amount I'll have to spend is $210 or more. That may not seem like a lot for a new wardrobe, but it can stretch miles for a few thrift store runs! It also limits me from blowing too much money on new clothes while I've still freshly lost weight. The best part is that I plan on getting a jar and putting the money in it as I lose the weight. This gives me a visual cue as to how much weight I've lost and how close I am. I've talked about my anxiety and depression before on this blog. I used to be ashamed of it, but it's something I've come to accept as a part of myself. It doesn't mean that I can't work on improving it. My husband and I have talked about a large number of potential solutions. The first step is analyzing my anxiety level. I'll be doing this by using this anxiety test, which gives me a number at the end. I want to be certain that I take this on days where I haven't had a major life change or event - anything that might trigger my anxiety unexpectedly. I want to get a gauge on my overall anxiety, not just how I'm feeling that day. I'll then be researching therapy options. Since our health insurance won't cover therapy and we make too much for financial aid (but have student loans so we don't feel the effects), we'll be seeking out low-cost options. During my December research, I ran into a list of cognitive distortions that add to anxiety, worry and stress (found towards the mid-bottom). I recognize these as thoughts I have during anxiety episodes. My husband and I will spend a bit of time coming up with questions he can ask me to redirect me out of those thought patterns. At first, it may have to be him alone that redirects my thoughts, but we're hoping that I can adopt the questions and start redirecting them myself over the course of a few months. In October, I noticed I was starting to have symptoms of an MAS flare. These flare symptoms are worse in the morning. Because all of my volunteer work must occur before noon so I put all of my volunteer work on temporary hiatus. In April, I'm hoping to return to volunteering. I'd like to spend some time researching stress and anxiety help apps for your phone. I'd also like to try adding a "worry period" to my day. The idea is that you push off all worrying in your head to a later defined period of time. 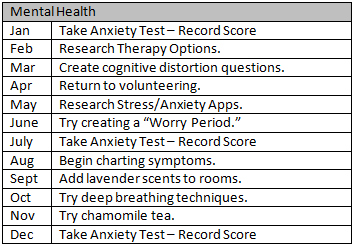 Charting my anxiety symptoms to discover any patterns, adding lavender scents to rooms to promote a calm atmosphere, deep breathing techniques and chamomile tea all make the list in an effort to manage my anxiety problems. In order to keep track of my goals, I will be posting up a list of them with some details about my progress and percentages of where I'm at from time to time. Every month, I'll look at my progress for that month. On the side column of my blog, I'll be keeping a yearly track of them. The percentages will be based on the concise plan I develop at the beginning of the month to complete the goal. Here is the template for my health goals! Stay on diet at least six days a week. – 0% complete. Exercise X times a week. – 0% complete. Improve mental health. – 0% complete. What are your health goals for 2015? I absolutely understand! I think a lot of the reason I really packed on the pounds is because I saw the scale go up from all the diets and testing, and it was impossible for me to imagine having to lose it all over again. It was so easy to give up, but it wasn't the right thing to do. Now it's time to fix it! Best of luck to you on your weight loss goals! Let me know how it goes! And thank you so much for reading! The above calculator is extremely accurate and takes more aspects of your lifestyle into account as opposed to other calculators, which often don't offer a sustainable daily intake. The one you've used seems off to me, and I'm concerned about setting such a large deficit for yourself. Your maintenance calories as calculated seem so low, so the deficit appears *extremely* low to me. That's just my two cents, and you might not even care to hear it, so I won't chew your ear off! I'm glad you're feeling better after some crazy health problems. Here's to a better 2015! I definitely appreciate it. According to the calculator, my BMR is 2096 and my expenditure is 2694. However, I have autoimmune problems which have slowed my metabolism and make it difficult to calculate just how much I should be eating. According to my doctor, I'm likely in the 1800-1900 range, so I use that to base my calculations off of more than the calculator I linked. In 2013 when I lost the weight, I started to gain when I ate over 1800 calories, which is also why I'm using that marker. 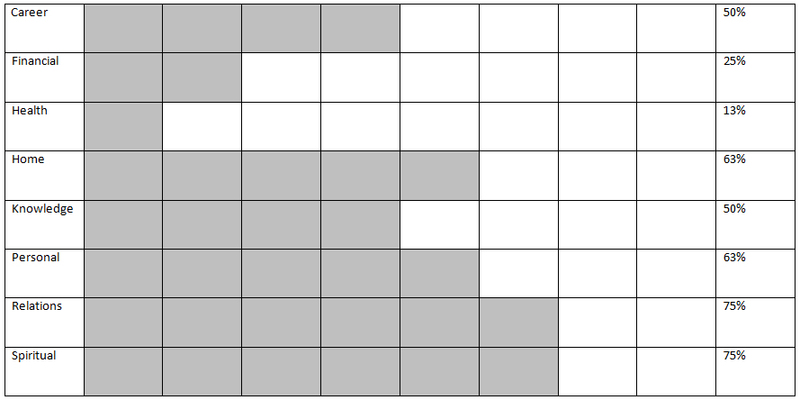 I linked the calculator as something others could use, but I will replace it with yours. I just likely won't switch my plan because I already know my metabolism is off. :) Thank you! My only fitness goal is to move, do a class or train 3x/week. Last year, I was so pumped in spring that I had really good results after 2-3 months of training. I'm what we call in fitness a "skinny fat" so not really weight to loose but I'm not in a healthy condition either. So I was pretty happy to see some definition in my muscles but somehow I got lazy and just ended the year doing nothing at all. I saw pictures of me when I was in shape and I just can't believe I let myself go ! 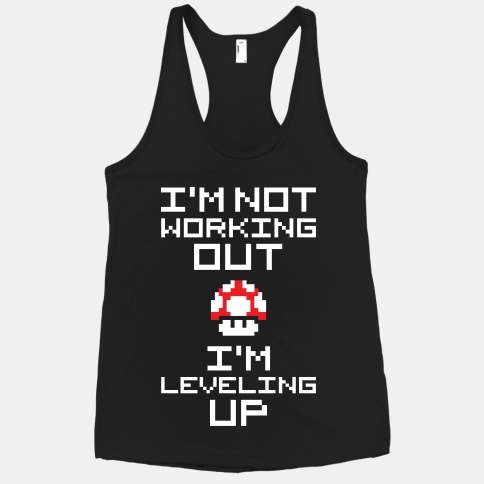 :( So my goal is to at least work out three times a week, at home or at my gym. 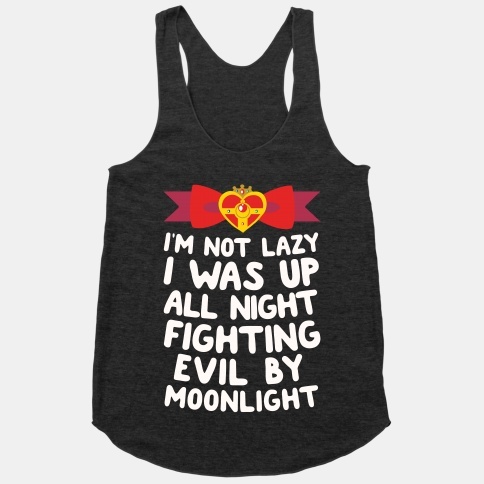 I'm working nightshifts and it's not always easy to schedule something but I'll find a way ! I just ordered class passes at my gym and will try to attend one class a week. My first class is a yoga one and it's in 2 days. Good luck on your fitness journey Marietta! I was terrified with my first yoga class because I was definitely a beginner, but it was a lot of fun. Like you, I find that classes keep me in shape more than anything I can do on my own. Good luck to you on your class! So glad your doctor is up to date on research and told you about FODMAPs. So many people think it is gluten they are having a reaction to when its not gluten at all but FODMAPs. I have two big tips for you. First, increase your protein in take well above what the FDA says you should get. Look at getting close to at least 100 grams on the days you work out. This will help you drop weight faster and reduce muscle fatigue. I have noticed a significant difference. Second, take an L-Arginine Complex. L-Arginine is converted in the body into a chemical called nitric oxide which causes blood vessels to open wider for improved blood flow. L-arginine also stimulates the release of growth hormone. This will also help reduce the build up of lactic acid in your muscle and allow for faster muscle growth. Take it on the days you workout as well. I also suggest people do yoga and check out BodyRock.tv. Yes its "hard" but Lisa is the best free trainer out there. I wish you the best of luck this year. I wish FODMAPs had been the reason for my stomach's villi bleeding, but unfortunately it was gluten. We tried it. However, it doesn't mean that eliminating FODMAPs from my diet won't help with other aspects of my autoimmune problems. My doctor suggested getting as many grams of protein as I do carbs - to aim for a 2-1-2 ratio of carbs-fat-protein, so that's what I've set my MFP account to. I'll have to speak with my doctor first before I consider taking L-Arginine. I never know what's okay with my health condition and what's not. But thank you for the tips!